The premise of Jennifer Keishin Armstrong’s Seinfeldia is that the show, about four self-involved New Yorkers whose daily lives make comedy grist, has infiltrated pop culture like no show before or since. From Elaine’s cringe-inducing dancing to Newman’s bottomless evil to George’s endless lies to Kramer’s wacky scene entrances, Seinfeld is a cultural touchstone. And Armstrong proves herself the perfect guide to understanding who, what, when, where, why, and how this show came to define American culture in the ’90s. Creation myths are a good place to start when writing about a TV show. The step-by-step breakdown of how the first idea for the show, Seinfeld’s Stand-Up Diary, failed miserably is an insight into what did and didn’t work. Larry David and Jerry Seinfeld are clearly established as very different comedic entities: the former a cynic, who “favored a guttural grumble that become a yell without a warning,” while Seinfeld’s intense ambition and genial material made him a more easygoing presence. Together, they retooled the show, alighting on the idea that it should be a reflection of their day-to-day lives. Armstrong is particularly skilled at weaving together the details of casting. Julia Louis-Dreyfus was not the first choice to play Elaine Benes, but when she joined Seinfeld, Jason Alexander, and Michael Richards, their characters became more defined, and the possibilities for daily mishaps greater and funnier. 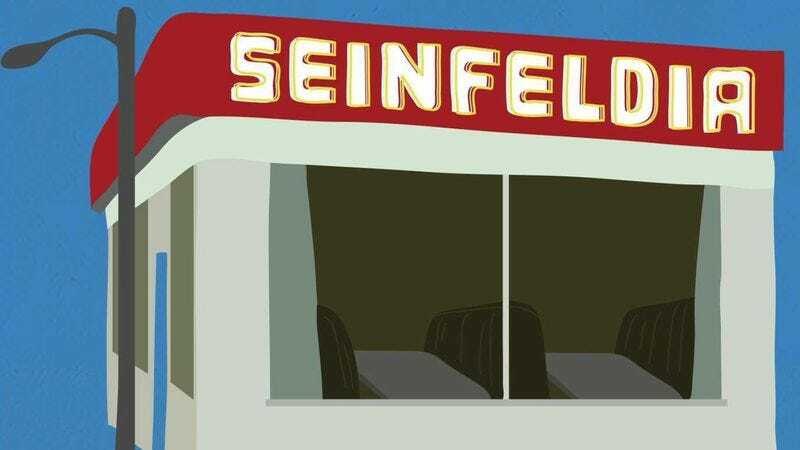 Seinfeldia is as close to a complete history of the show pop culture is likely to get. Detailing the lives and thoughts of the show’s writers provides exceptional insight into the show’s sensibility: Peter Mehlman, who didn’t always feel comfortable calling himself a TV writer but wrote gems like “The Sponge” and helped steer the show after David’s departure; Spike Feresten, who came to L.A. with his pockets filled with the stories of his friends’ daily lives in New York; Bill Masters, writer of “The Contest,” the show’s watershed moment, who almost didn’t return David’s phone call to hire him because he thought David wanted theater tickets; Andy Robin, writer of “The Junior Mint,” who was both so dissatisfied with his script and so afraid he’d never top it that he left show business for medical school. It’s clear that David and Seinfeld enforced pathos and ethos—“no learning and no hugging,” contrary to sitcom tradition—but their writers worked to preserve and defend this maxim in their every pitch. Seinfeldia is as funny and interesting as a good episode of the show it covers. Armstrong’s pacing and attention to detail makes it a book about pop culture that goes by almost too quickly. Luckily for fans, Seinfeld has sprouted everything from “ASSMAN” license plates to “master of my domain” sweatshirts to an entire luxury bus tour of the show’s New York City landmarks, run by the original inspiration for Kramer, a neighbor of David and Seinfeld’s. The devoted fan could even visit his Manhattan apartment, thus making it possible to literally enter Seinfeld via one of its inspirations. Reading this book might be easier than that overenthusiastic fan behavior. Not that there’s anything wrong with that.